Embark on an unforgettable narrated helicopter flight to an exclusive landing site on the floor of the Grand Canyon West Rim. Soar over majestic views of Lake Mead, the Hoover Dam and extinct volcanoes before an incredible descent through 4,000 feet into the depths of the mighty Canyon, touching down by the banks of the historic Colorado River to explore the pristine Native American Hualapai lands. Hike to the base of the river for a short pontoon float trip along the Colorado River before climbing back aboard your helicopter for a short flight to Eagle Point where you can experience the spectacular Grand Canyon Skywalk. 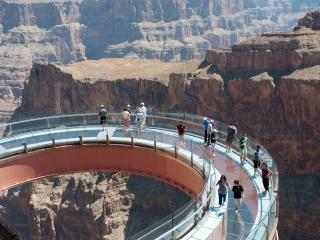 This amazing glass walkway allows you to walk out over the Canyon rim and experience birds-eye views to the Colorado River 4000 feet below your feet. Tour operates: Daily, year round including pick-up from Las Vegas Hotels. Start Times: 6.45am (6.30am during the summer months) and 9.30a. Las Vegas hotel pick-ups start up to 90 minutes before the departure time. Includes: Scenic Helicopter tour to the Grand Canyon West Rim aboard a state of the art Eco-Star helicopter, Views of Hoover Dam, Lake Mead, Colorado River and Grand Canyon West Rim, Descent into the Grand Canyon and 30-minute landing on canyon floor, VIP front-of-the line pass to the Skywalk, Souvenir photo and snack pack, 15 minute Colorado River pontoon boat ride, Complimentary round-trip hotel transfers from most major hotels located on the Las Vegas Strip & Downtown Area. Duration: About 6.5 hours from hotel to hotel. Helicopter flights to the Grand Canyon are about 35 minutes each way. Ticket Types: There is a choice of 2 tickets. Prime Time tickets must be purchased for flights between 9.00am and 11.30am. Off Peak tickets are for all other times. There is a choice of 2 tickets. Prime Time Tickets must be selected for departures are 9.00am to 11.30am. Off Peak tickets can be selected for all other times. Helicopters are very sensitive to weight and weight distribution. As such anyone weighing over 275lbs must have 2 seats on the helicopter and a $100 supplement will be applicable upon check-in if you exceed this weight. All passengers must be weighed at check-in.